Check Out the Creepy Trailer for NBC’s New ‘Hannibal’ Series!!! Dr. Hannibal Lecter is alive and well these days. 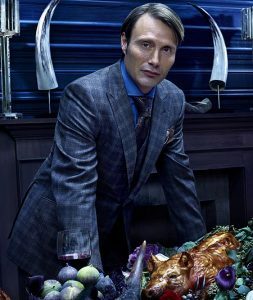 NBC has just released a cool trailer for their new series ‘Hannibal’, which follows the insane and brilliant killer, Dr. Hannibal Lecter. Hugh Dancy will play Will Graham, the FBI criminal profiler and Mads Mikkelsen will play the good Doctor. This will be based on ‘Red Dragon’. Caroline Dhavernas, Laurence Fishburne, and Gillian Anderson will also star in the series which will start airing on NBC on April 4th and will have 13 episodes to start. Hell of a cast right now. I can only hope that this sort of story does well on a network station. Seems like this should be on a pay-cable channel. Oh well, I guess we’ll see, but until then, enjoy the fava beans and chianti, and of course the trailer. This entry was posted on Tuesday, February 19th, 2013 at 1:00 am	and is filed under Film, News, Television. You can follow any responses to this entry through the RSS 2.0 feed. You can skip to the end and leave a response. Pinging is currently not allowed. Lara, it's a clock, it ticks, it tells the time.